This spinach + feta frittata is a healthy, easy meal for breakfast, lunch or dinner! Heat a 12-inch nonstick skillet over medium to medium-high heat. Add EVOO, 4 turns of the pan, add scallions and garlic and stir for a minute. Add herbs and start wilting in spinach in bunches; once wilted, season spinach with salt, pepper, nutmeg and douse with juice of ½ lemon. Add breadcrumbs and feta to pan, pour eggs over and gently stir to combine. Settle the eggs and let them set for a minute or so, then gently arrange the very thinly sliced tomatoes in a circle layered about 2 inches in from the edge of the pan. Bake frittata until puffed and golden, about 25 minutes. Loosen edges and remove frittata to cutting board or platter; cool for 10 minutes. 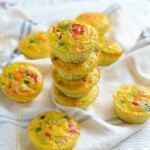 Cut the frittata into 6 or 9 squares and serve.